With solid state components and no moving parts, our systems are built to last and will generate energy for decades. By investing in solar now, you can control your energy costs and realize immediate savings. PV Squared understands commercial energy needs, knows the incentives and financing options available, and will work closely with you to deliver a project that minimizes disruptions and maximizes financial returns. 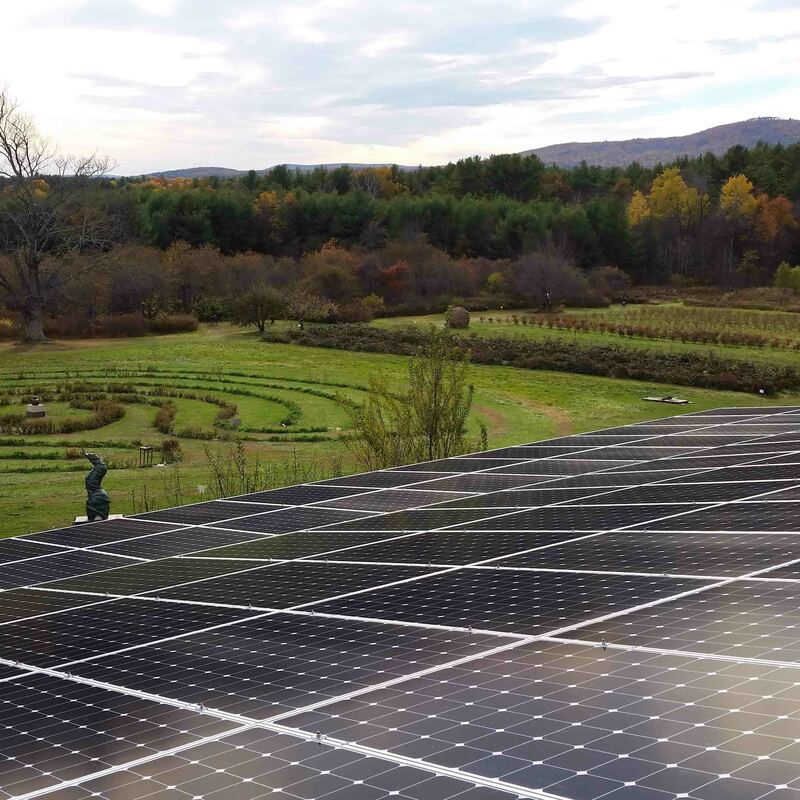 To date, PV Squared has installed solar for over 100 businesses, farms, and institutions in Massachusetts. 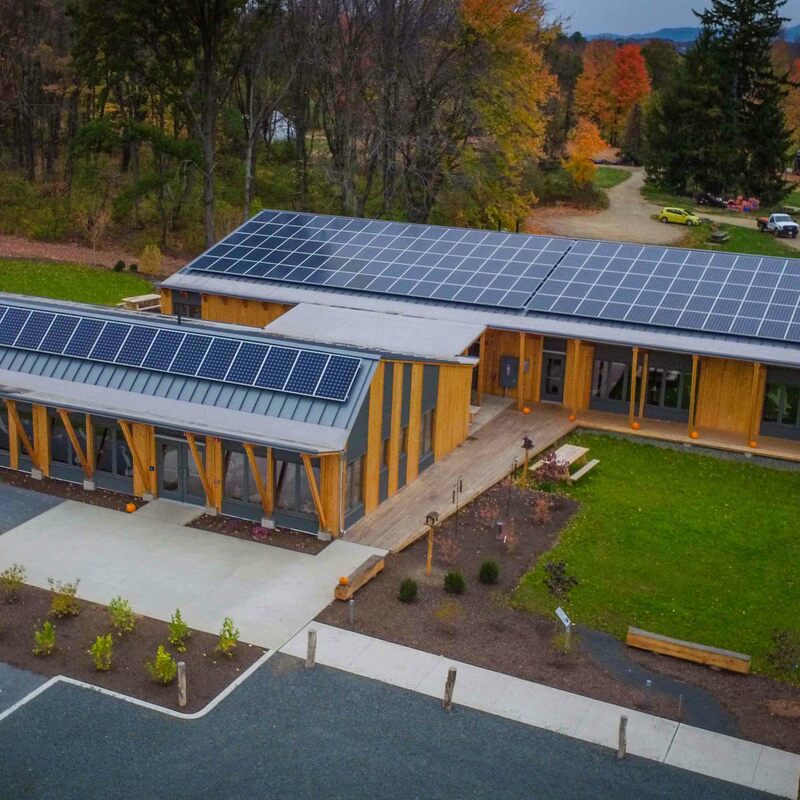 The Hitchcock Center’s mission is to “foster greater awareness and understanding of the environment and to develop environmentally literate citizens.” As a values-aligned business, we were honored to work with them to design a solar system for their new Living Building Challenge facility. 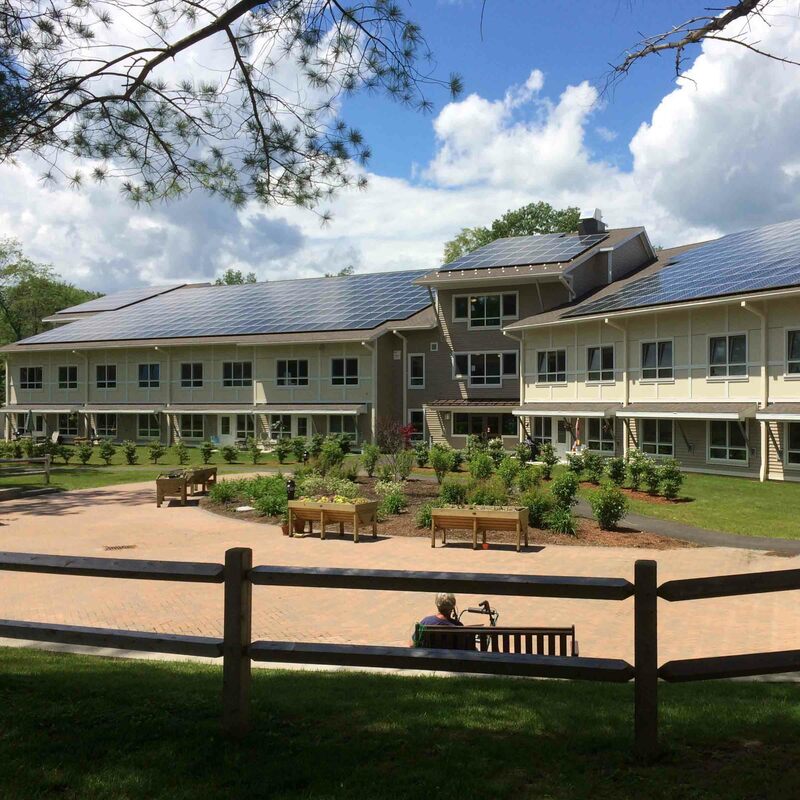 Located in Williamstown, MA, Highland Woods is a welcoming, independent-living community designed for elderly residents, and can also accommodate disabled residents. 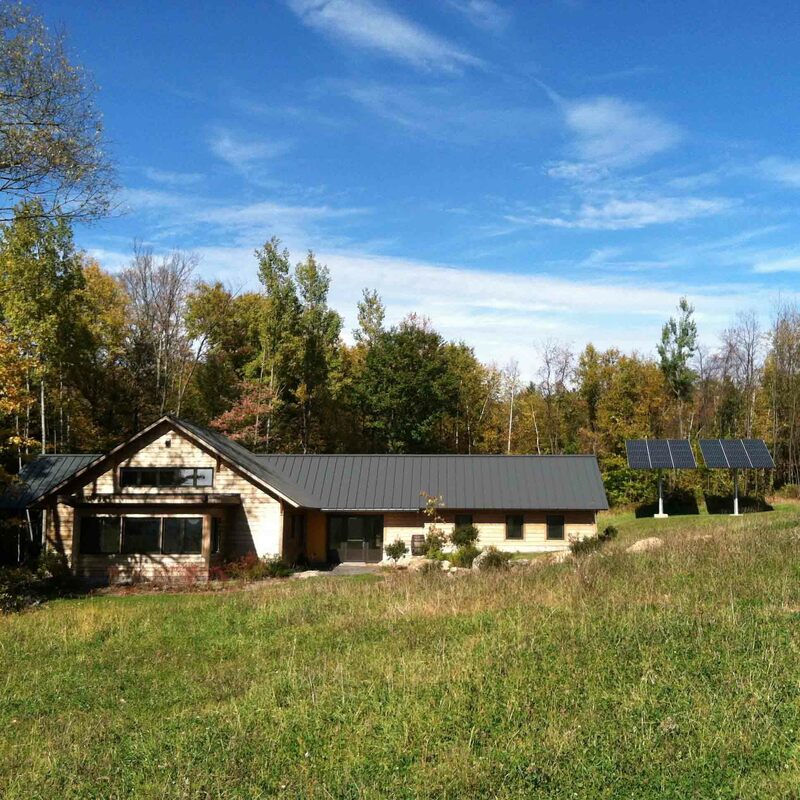 All units are energy efficient, in part due to the 180 kW solar array we designed and installed. With a self-guided sculpture trail weaving through their fruit gardens, Park Hill Orchard combines art and agriculture for the community to enjoy. 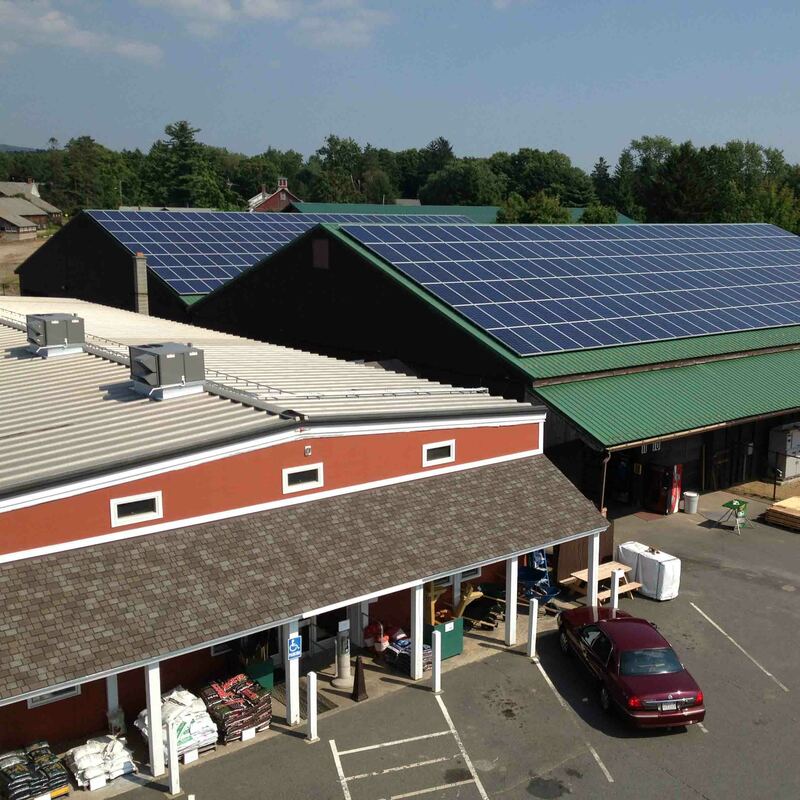 We installed solar panels on their farm stand to power sustainable practices and significantly reduce their energy costs. The R.W. 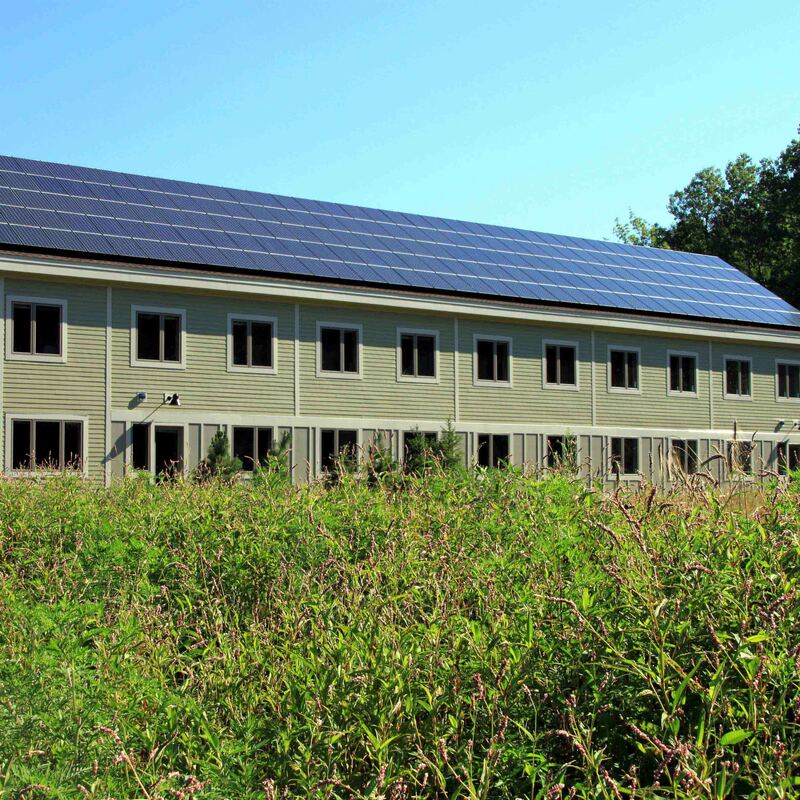 Kern Center at Hampshire College was built to meet Living Building Challenge standards. With a PV system size of 118 kW, the R.W. Kern Center is successfully generating more than enough energy for the entire building. 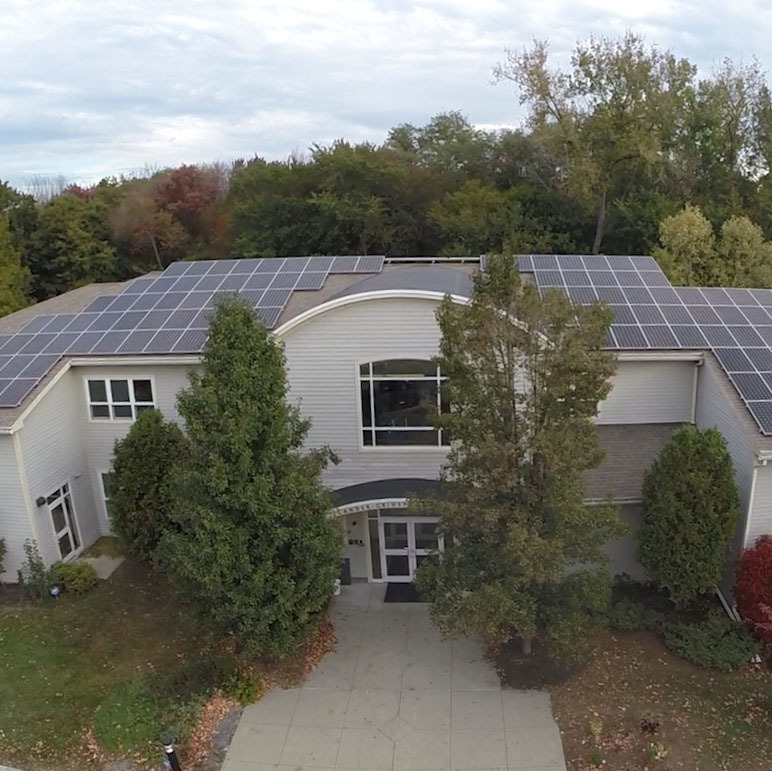 This 38 kW solar system was designed to reduce energy costs by generating approximately 47,300 kWh per year. Located in Bernardston, The Steel Shed provides quality steel and service to their customers across the Pioneer Valley. The Bechtel Environmental Classroom at Smith College was our first collaboration on a Living Building Challenge project! 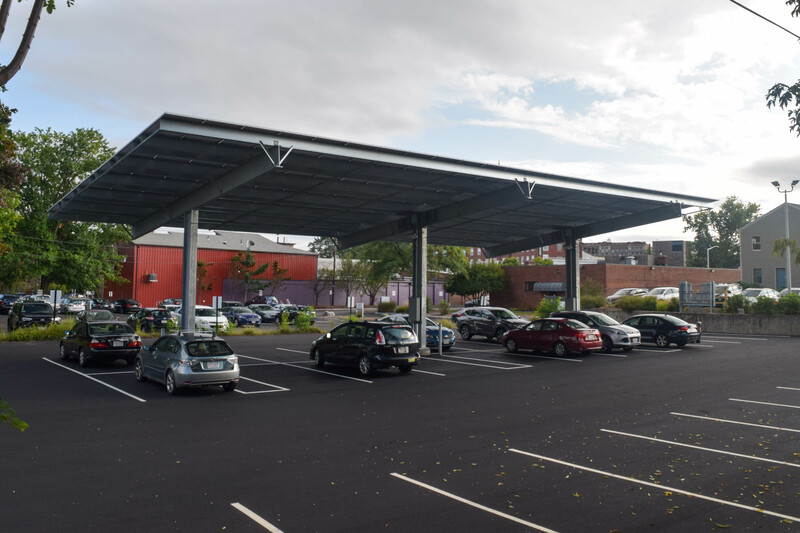 The 9.4 kW top of pole mount (TPM) solar array effectively produces more electricity than the building uses on an annual basis. Located in Granby, Countryside Animal Hospital is a complete service companion animal practice. 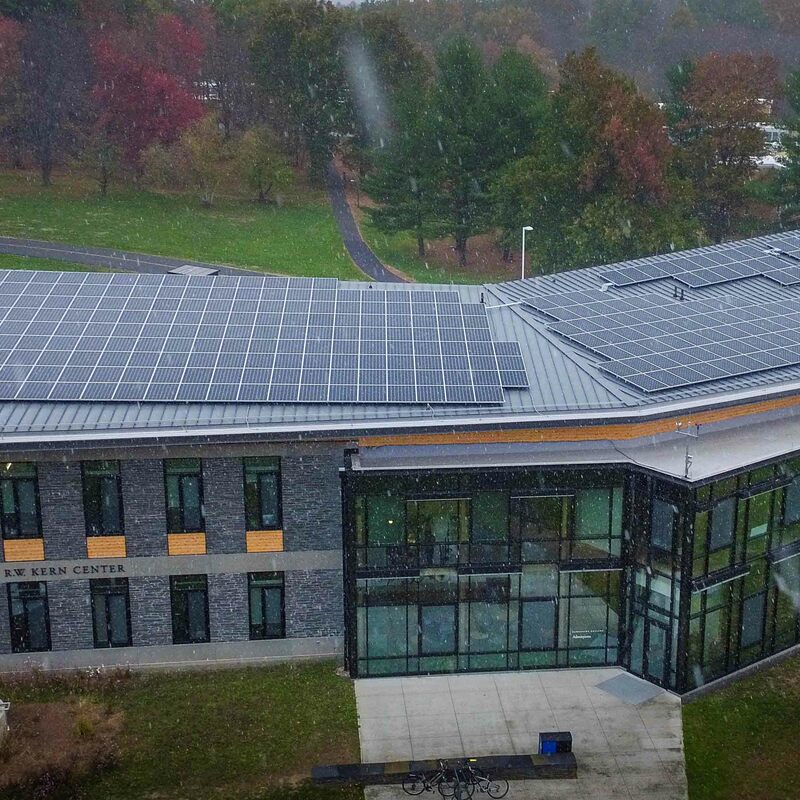 Designed to meet approximately 88% of the business’s annual electricity usage, PV Squared installed a 31 kW roof-mounted system containing 96 high-efficiency solar panels. Williamstown Youth Center is a non-profit dedicated to providing quality recreational programs to children in grades 1-12. 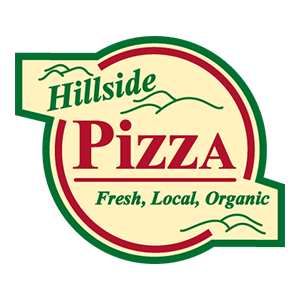 Their 95 kW array has had a significant impact on their operating expenses so they can focus on delivery quality programs to the community. Dean’s Beans, located in Orange, is dedicated to providing quality coffee beans while modeling socially just and environmentally responsible business practices. 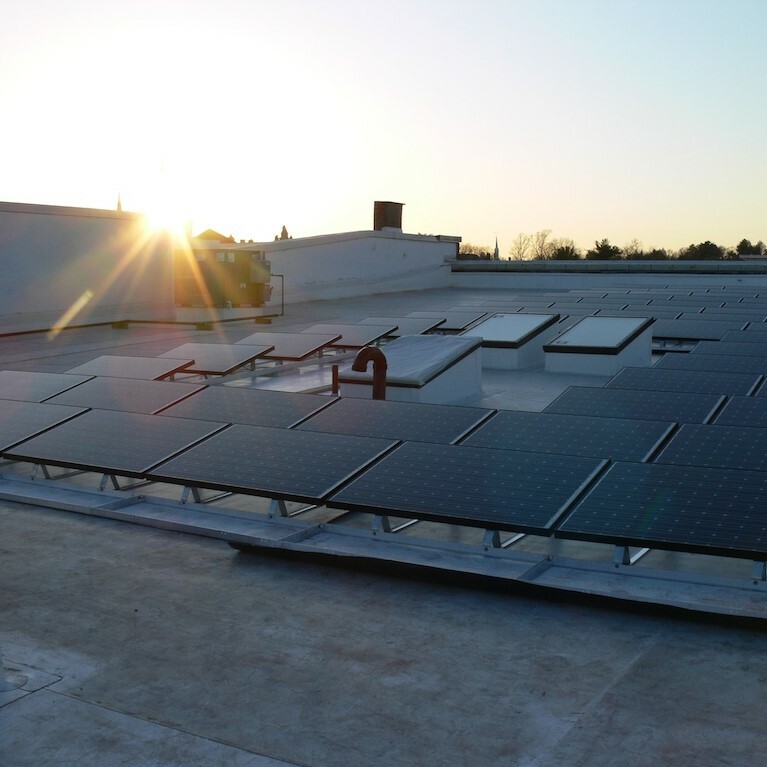 Their PV system accounts for about 65% of the business’ electricity use, and 100% alignment with its social values. Real Pickles specializes in fermented and raw, northeast grown, 100% organic food and is on a mission to build a better food system. They’re also our neighbor and fellow worker-owned cooperative! 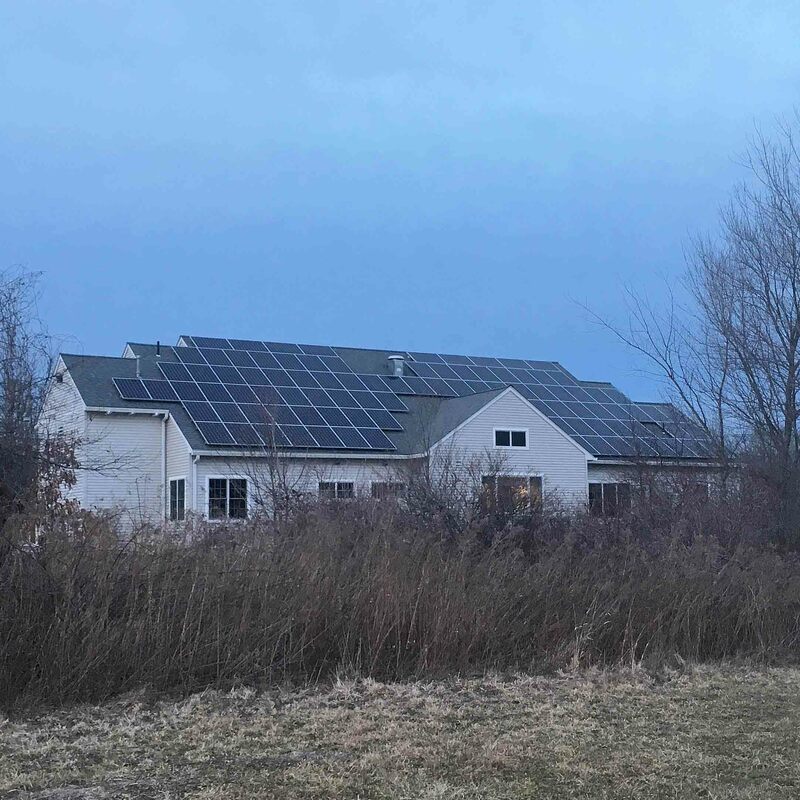 PV Squared was more than happy to install a 17 kW system to reduce their operating expenses and become more sustainable. Zoar Outdoor specializes in adventure activities such as rafting, zip-lining, and kayaking in the picturesque town of Charlemont. PV Squared installed solar panels on four separate buildings to significantly decrease their electric bill when operations are in full swing. The 25 kW system offsets about 80% of their electricity use. Lander-Grinspoon Academy is a private Jewish day school based in Northampton that has incorporated principles of sustainability and environmental stewardship into their curriculum. 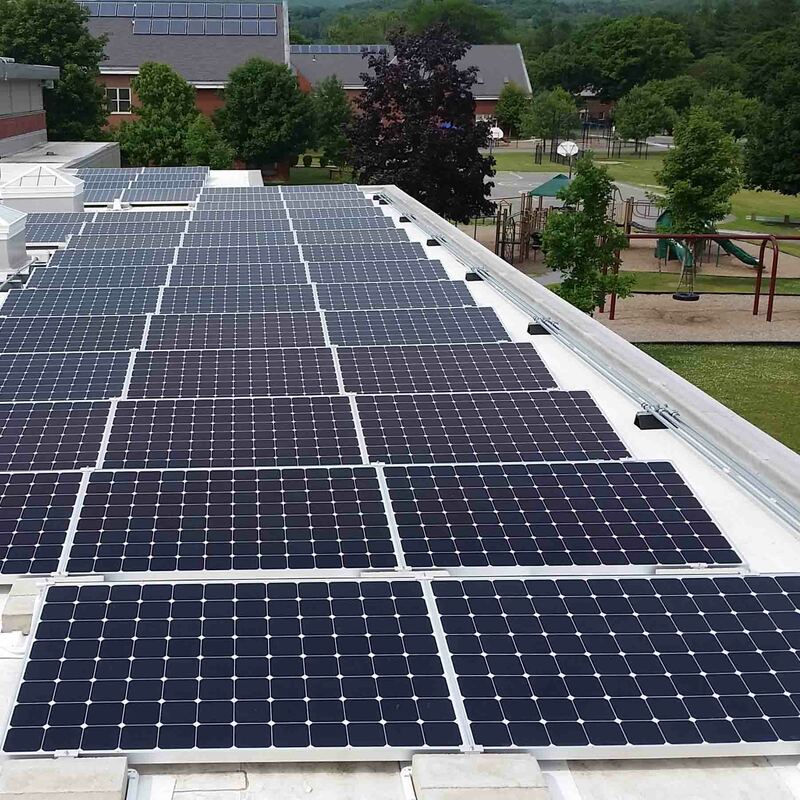 This 48 kW system has successfully reduced the academy’s annual energy costs, and has also provided a hands-on learning opportunity. 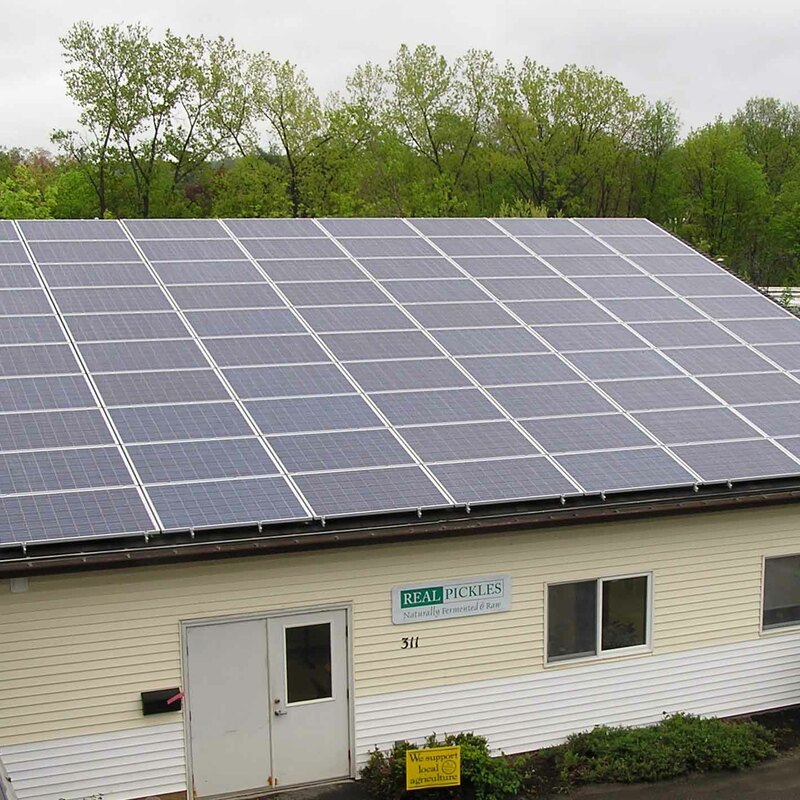 Family owned and operated since 1741, Cowls Building Supply is an Amherst landmark that was ready to make the long term investment in solar energy. 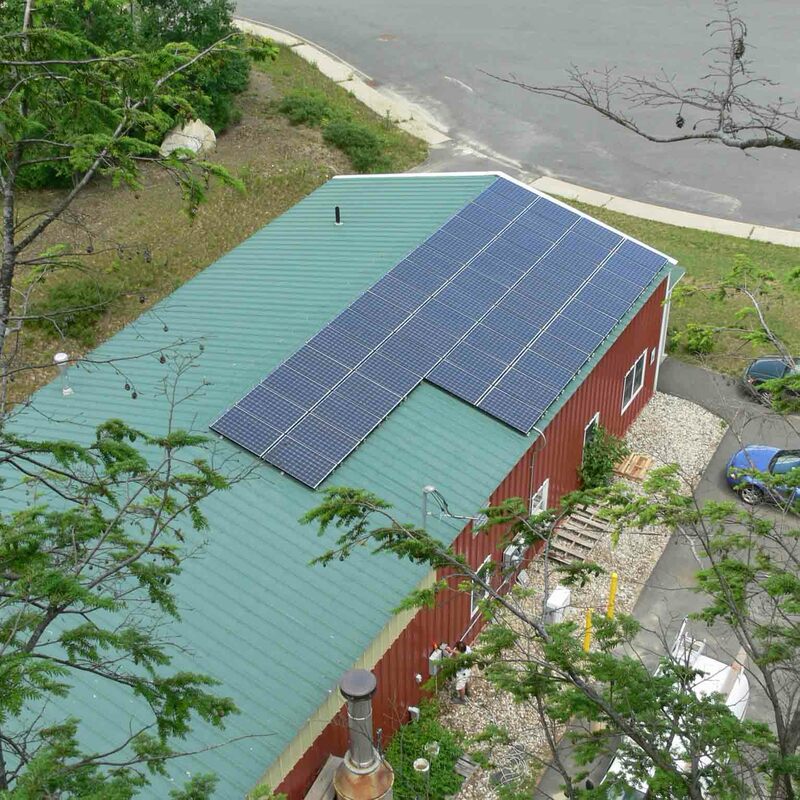 The 119 kW PV system atop their roof has reduced operational costs and their electric bill. Thornes Marketplace is a vibrant shopping center full of boutiques, eateries, and retail outlets in downtown Northampton. 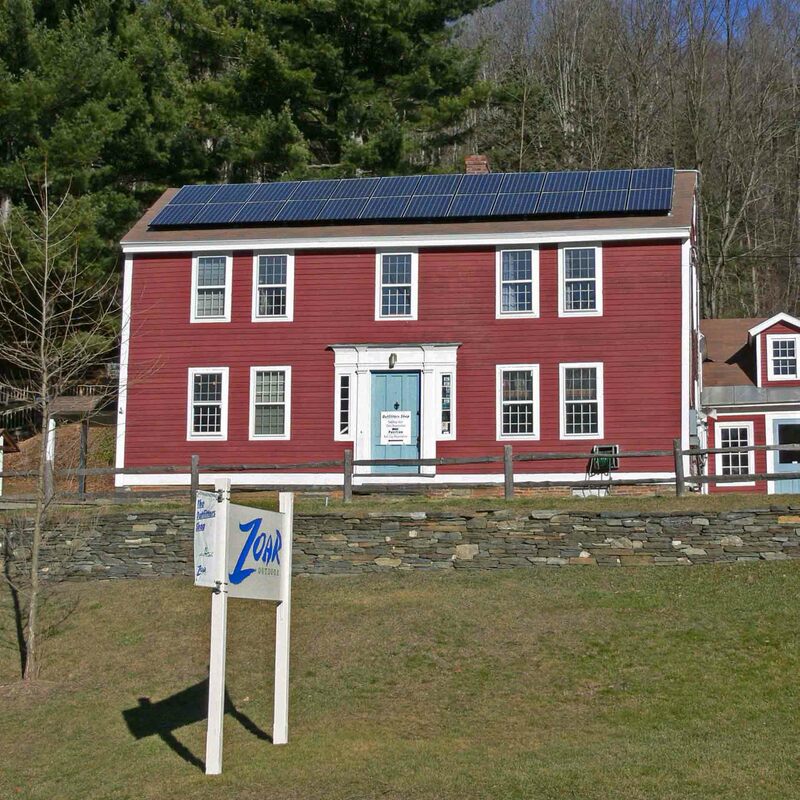 The solar panels on this historical building gives local vendors and customers an environmentally friendly shopping experience. Passionately committed to the environment, SWCA Environmental Consultants have a roof mounted solar system as well as pole mounted arrays. The system greatly reduced operational costs by generating 39,000 kWh per year. 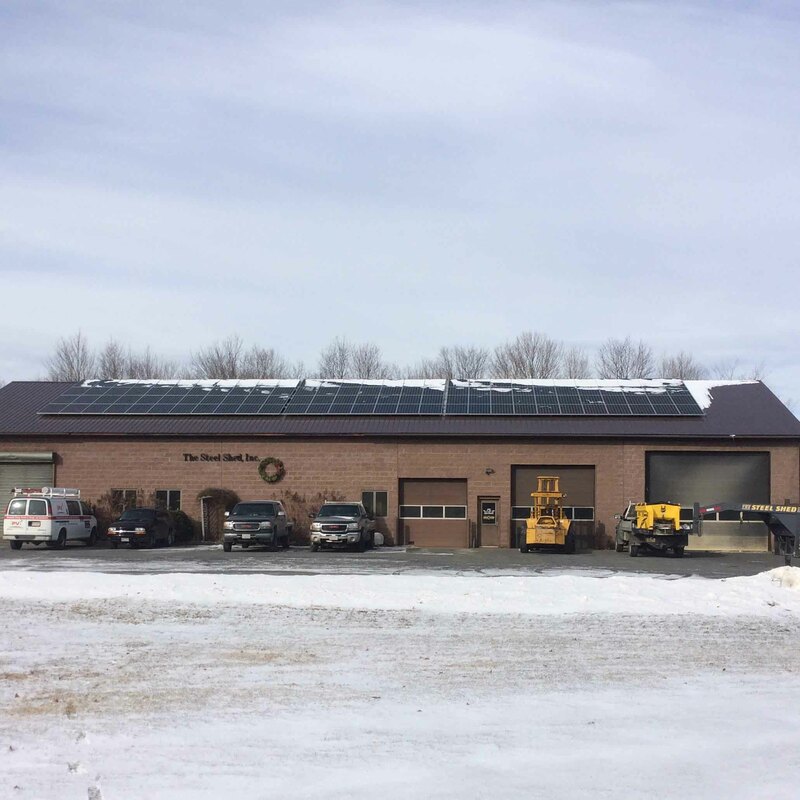 PV Squared installed a 61.6 kW solar carport for West County Equipment at their facility in Greenfield. 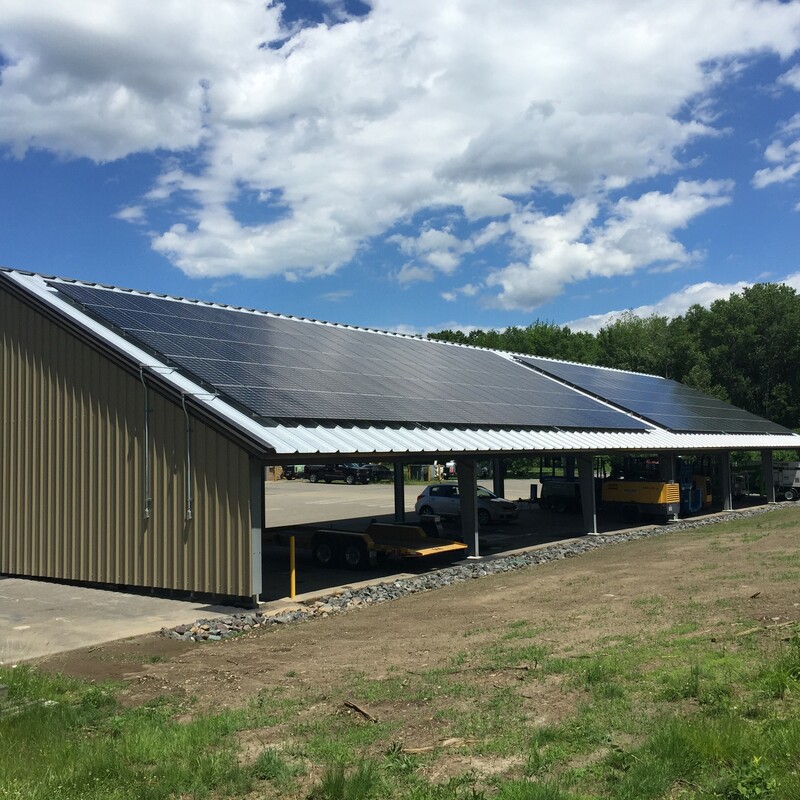 Michael Humphries Woodworking in Northfield has a 56 kW solar carport that PV Squared installed in 2016. 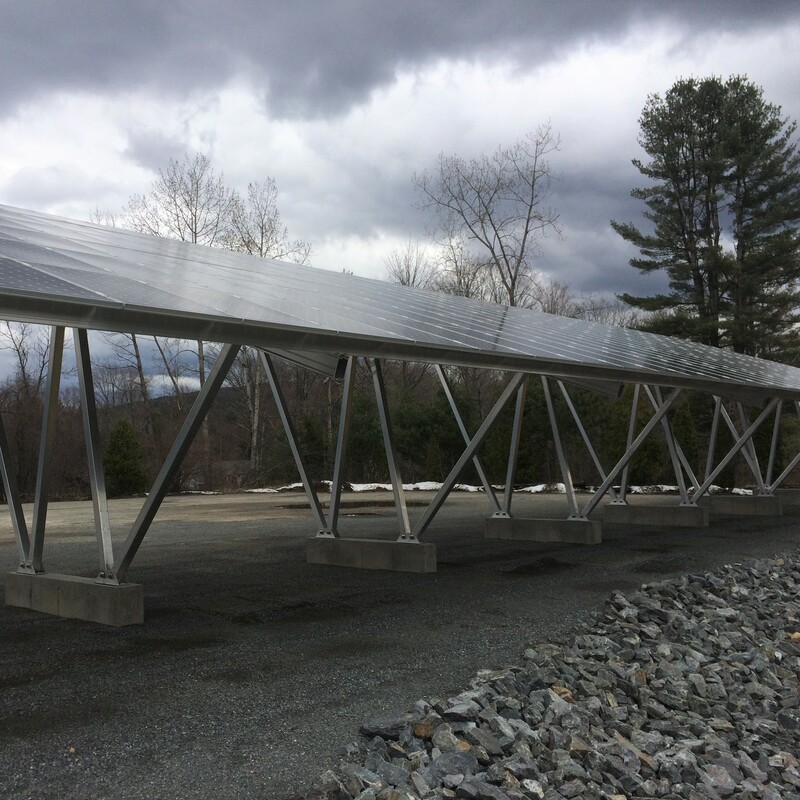 This 64.62 kW solar carport for Whalen Insurance in Northampton was installed in 2018. Get started with solar energy today!